With the end of 2016 fast approaching and 2017 on the horizon, now is the time to think about updating your outdoor space. It can be hard to keep up with all the trends flying around blogs and social media so we’ve collated a few of our favourites for you here. First and foremost, the timeless classics are (not surprisingly) still in fashion. Extravagance has no place in the Aussie backyard, unless you’re an eccentric billionaire with more money than taste! Do away with gaudy colours and wasteful water features and stick to natural tones. Shades of grey, beige, and brown make for great outdoor settings year-round provided they match the style inside your house. Whoever first thought to add a sunroom to their home was definitely on to something. Modern home design has found creative ways to blur the indoor and outdoor living spaces by extending the style inside to an outdoor room. These semi-closed structures, unlike the old style closed in sunrooms, provide fresh air and shade from Perth’s hot sun during the day and are lit up for comfort at night. Finished with classic stone pavers and furnished to seamlessly match the inside of your home, outdoor rooms are perfect for year-round entertaining. Consider integrating elements like bifold windows and wide doorways to let fresh air in and to blend the two living areas together. Australis engage with their customers to consider closely the use and flow between the two areas. It’s important to choose suitable indoor and outdoor surfaces that both complement one another and enable the seamless transition between the two. It’s also important the surfaces are long lasting, easy to maintain and that you can enjoy the space all year round. Australis Pavestone’s African Stone is a luxurious addition that suits the outdoor room perfectly. Normally, the two don’t mix. But in outdoor areas adding a fire pit or fireplace is a unique way to add versatility and warmth (sorry) to outdoor entertaining. Alongside the pool or spa, a fire pit can be used to keep warm in cooler months – especially in a more enclosed yard – as well as adding flair to outdoor cooking. Imagine all the marshmallows just waiting to be toasted! Fire pits are best placed on paving stones to avoid the obvious fire risk near grass and plants. They can be made from custom fabricated metal or arranged stones designed to reflect heat with a more rustic finish. Trends in outdoor living call for modern colours with minimal flair. One or two feature pieces like a fire pit or wall decoration add personality and usefulness to outdoor rooms. Australis Pavestone are known for their personalised service and expert advice. 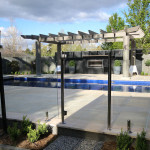 Chat to one of the team at Australis Pavestone today about transforming your outdoors this summer.